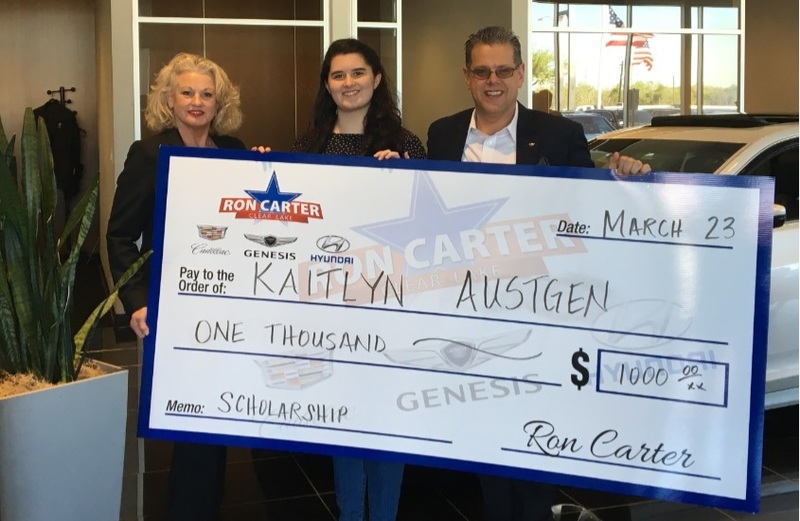 Denise Stanley, left, Ron Carter Clear Lake dealership liaison, and Ron Carter Cadillac Hyundai Marketing Director Chris Premont, present scholarship check to Kaitlyn Austgen, Clear Horizons Early College High School senior. Ron Carter Clear Lake has announced the first recipient of the 2017 Ron Carter Clear Lake Community Achievers Scholarship, Kaitlyn Austgen, who was awarded $1,000 in scholarship funds, and plans to major in Anthropology and Political Science at the University of Houston. Austgen will graduate from Clear Horizons Early College High School in June after having already earned an Associate’s Degree from San Jacinto College in May. As an accomplished high school student, she was the founding president of the Clear Horizons Gay Straight Alliance and served on Student Council. In addition to mastering her academic pursuits, Austgen also worked countless hours volunteering with a myriad of service and cultural organizations throughout our community. Ron Carter Clear Lake offers the Greater Clear Lake Area high school seniors an opportunity to participate in the Ron Carter Clear Lake Community Achievers Scholarship. Five college scholarships of $1,000 each are awarded to the deserving participants that are chosen, beginning in March. Applicants may be students of public, parochial, or home schools. Ron Carter Clear Lake is pleased to offer high school students of the Greater Clear Lake area a chance to partake in the yearly Ron Carter Clear Lake Community Achievers Scholarship as a way to show appreciation for the hard work and dedication of the college-bound seniors within the Clear Lake community. Downloadable scholarship applications and guidelines are available at: www.roncarterclearlake.com. The Ladies Board Nursing Scholarship is available for the applicants who are interested in the profession of nursing and are residence or work in Loudoun County. Application Deadline is April 11, 2017.